Thank you for sharing with me the journey of the reed. 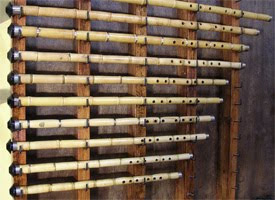 For centuries, the reed has set out for a continuos journey to become a ney. The reed has a unique and strong alluring warmth to it. When you listen to the reed, you will notice it is trying to explain something to you. Perhaps listening to it once will not be enough. As you listen the more you will continue to listen and begin to take your first steps in the journey within yourself, and will at last begin to question where you came from and where you are going. Above all, if one embraces the Ney, the Ney will share your emotions and through your breath it will tell the things that you are trying to say. It will become love to the ones who understand it, and remain just an instrument to those who do not. The "Nây-ı Şerîf" has been entrusted to us by Hz. Mevlana and through the knowledge I have developed over the years through my valuable teacher I offer you quality neys which will be your companion and can be past down to your children and grandchildren. Copyright © 2001-2019 Gokhan Ozkok, All rights Reserved. Web Design / Template Customizing Erman Ergunal.